Just a week ago or so I was commenting on a bike ride that it was almost El Tour de Tucson time and that the weather should be going from «hot» to «just about perfect». 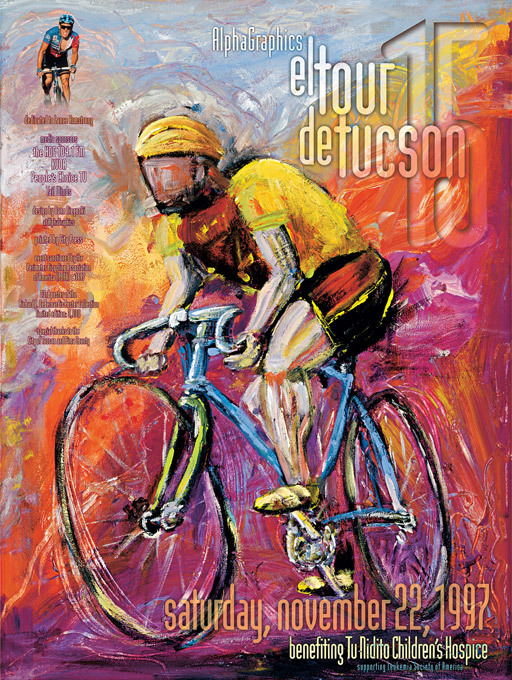 Going along with the «If you think it, you will get the call» idea, I was informed of an upcoming magazine article about the art of the El Tour de Tucson bicycling event and that two of my posters were requested to be included. 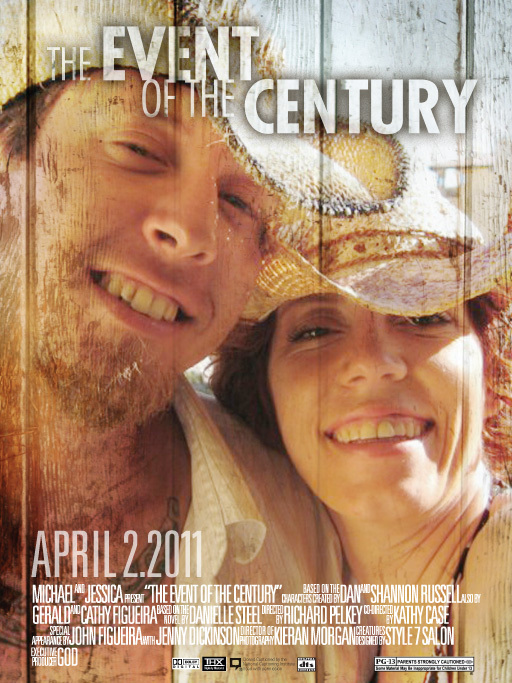 Then they asked for a third, so went back to my archives to pull the digital files [but not the 2006 poster previously detailed in this blog]. 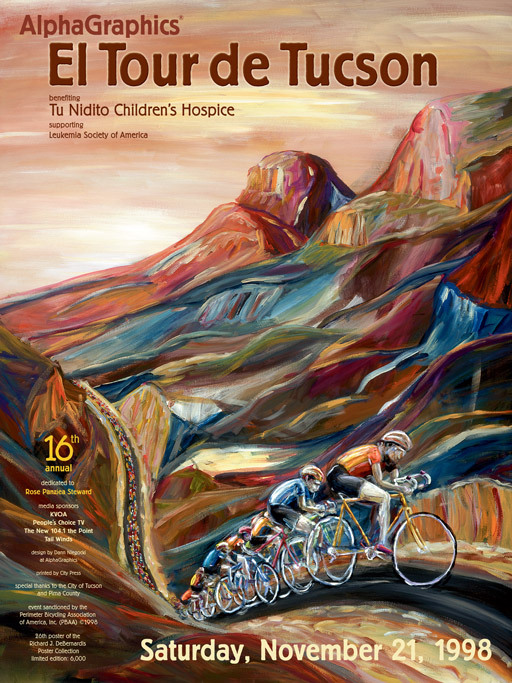 At the time of the first poster I created for the organization, the posters were all wonderful photographs but to me, they were lacking energy, especially as there are now over 9000 cyclists riding in the event each year. My first thought was a painting, and I am glad that I ran with that thought which was way better than making something out of pasta and glue, though I still think about that medium. My children look at this first poster and ask me if I know how to draw a bike [I do] but this cyclist was to be all cyclists, neither a racer or a recreational rider, heavy, thin, expensive road bike or old beach cruiser. I painted it purposefully ambiguous. It also happened to be the first year of Lance Armstrong’s return to competitive cycling after cancer, having previously won a single stage in the Tour de France in 1995. He returned to racing in 1998 and I claim no foresight into the rider on the poster wearing a yellow jersey. 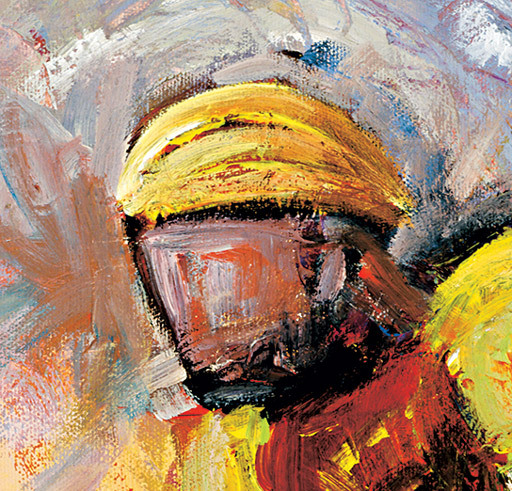 Close up shots of both Lance and the brushstrokes in the painting. The following year I was asked to do another painting. This was back when the route went clockwise, and though the cyclists would not have seen the atmosphere look like this on the course, I wanted to capture that late November sun in Tucson. The sky is a bit yellow, and the shadows and colors stand out a bit more in the Catalinas – stylized, of course. If you have driven on Sunrise between Craycroft and Kolb, you know exactly where this could be. If you have been stuck in traffic waiting for what seems to be the longest line of cyclists ever created, then you get the idea behind the long strand of cyclists stretching into the distance. If I had to pick my favorite poster, this would have to be it. 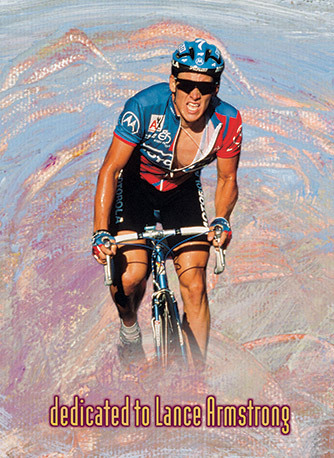 In more recent years the poster art doubles as the art for the cycling clothing and this would not translate well. If you happen to be in Casa Molina on east Speedway, excuse yourself for a moment and you’ll find this poster hanging in the hallway leading to the restrooms. This last poster of the three chosen tends to be the crowd favorite. 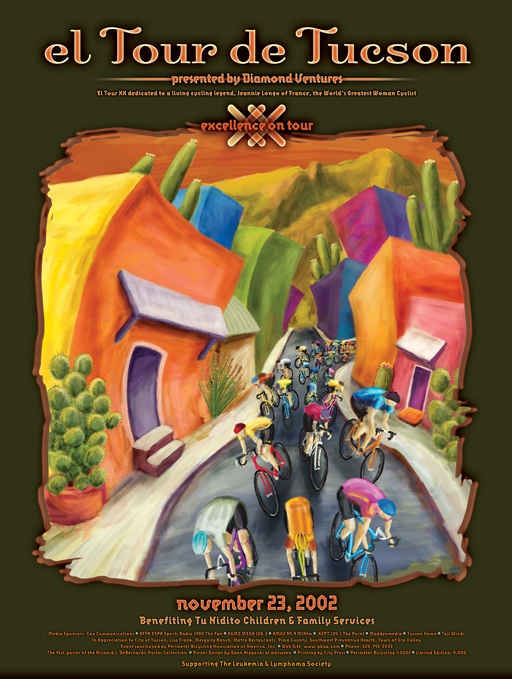 Not any particular area or barrio in Tucson, it depicts the early start downtown and the brightly colored buildings that are found sprinkled here and there some of the older parts of Tucson. It definitely shows what seems to be the craziness of a pack of cyclists coming through the smaller city streets. 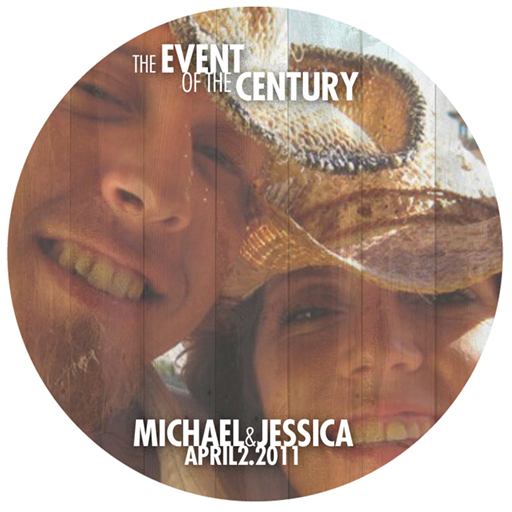 At the time I had very little time, and it was an entirely digital creation. 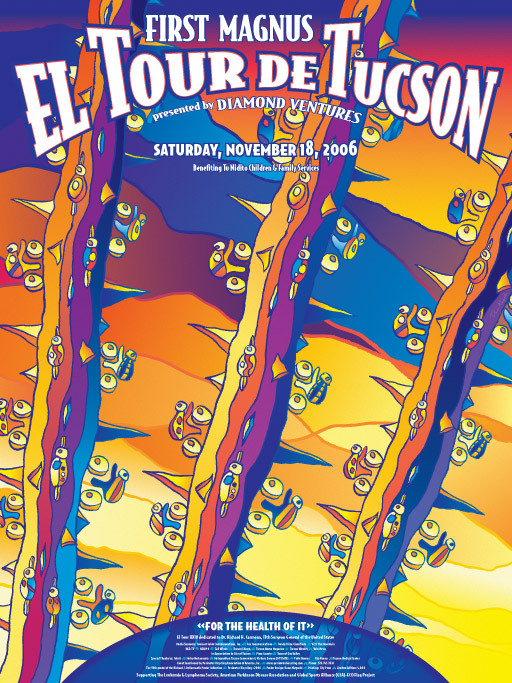 In 2002, that put a lot of hurt on my computer but it came out just fine. If I was ever to repaint a poster, this would be the one, just to recreate it with more detail and brushstrokes. There are benefits to being a designer within a larger business, and most of those benefits can be directly realized by our clients. Maybe you have been there — taking your logo to a handful of businesses to get different items produced, dealing with people not having the right software, color problems, and explaining everything repeatedly. And in the end, you hope that all the pieces work together. That doesn’t have to happen as we produce a wide range of products in-house. Design, yes, and printing and copying — those are a given most everywhere. 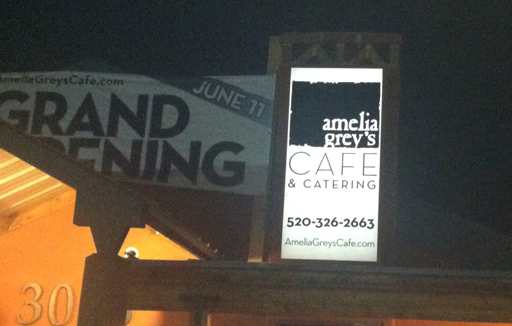 When Amelia Grey’s Cafe & Catering was preparing to open, we covered a bit more than just those three. The photo below? We did none of that though is does make the mouth water. We started off with two logos, one for the cafe and then another for their catering business. After dozens of ideas, the large block for Amelia Grey’s would make a great mark that would be memorable as well as the pairing of two typefaces that play well together. For the catering it was a bit more classy, almost modern nouveau but not exactly. So step one [at least on our end] was complete – on to the rest of the necessary items. We do large format printing, so the Grand Opening banner needed to be up to promote the new business, and we do cut vinyl as well, so we replaced the previous back-lit signs as well. That saved a trip to the sign company, seeing how it was all done in-house. What isn’t shown are two more street-side backlit signs, and if you look real close in the image below you can barely make out the cut vinyl logo and hours in the window — we do those too. You can’t sell food without a menu, so that was next. We produced them as well and they are shown sitting in a homey basket below. 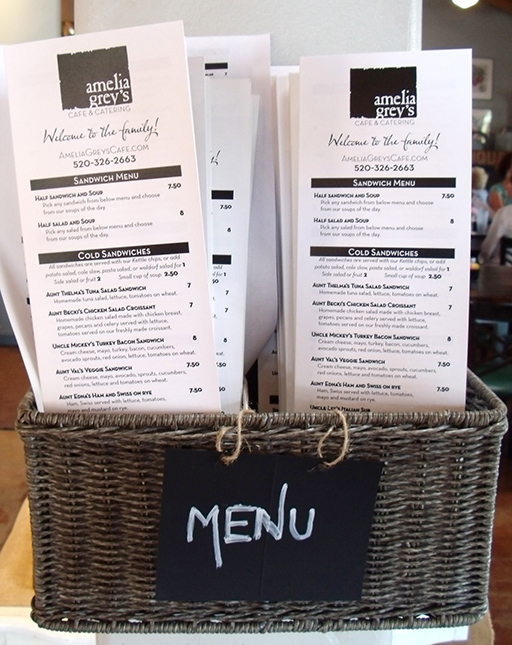 There was a fair amount of time to get that menu to both flow and be legible on the menu boards and they came out great. 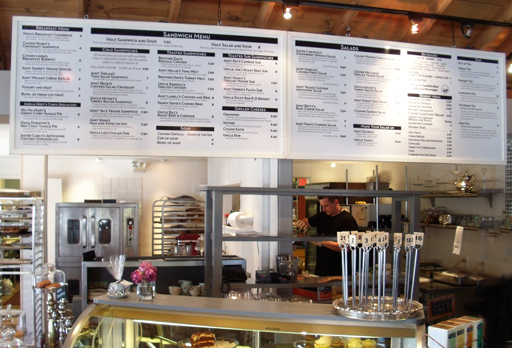 Most anyone standing in line can easily read the menu. 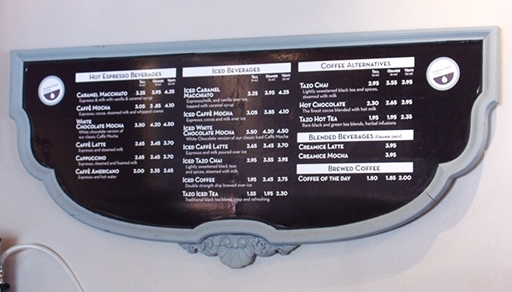 There was also the coffee menu, which was put on an old inverted head board which has great style on its own. Shirts and aprons? 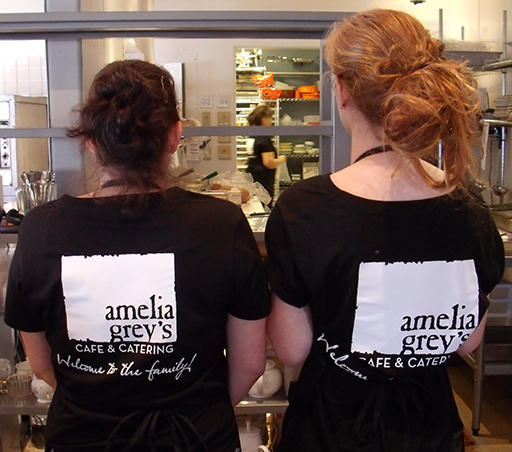 We can print on those as well, with Amelia Grey’s shirts and aprons with each of the logos on them, depending on the event. 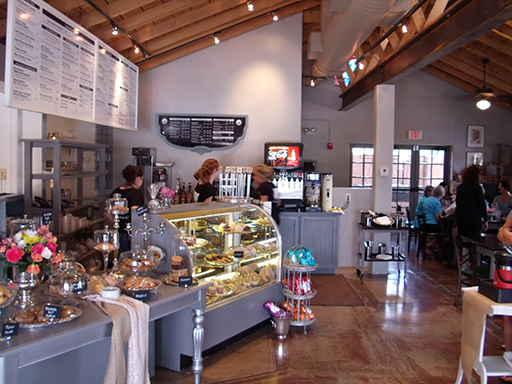 I am still working on the website — now the cafe is open and serving customers, there are a lot more photos to put up as well as setting up the online ordering for their catering services. It’ll be dolled up soon, and the online ordering should be helpful. What else? Labels for the food packaging [little round ones to close up the packaging and on the sandwich paper, as well as for label fights], business cards and soon to be invoices along with other promotional material. 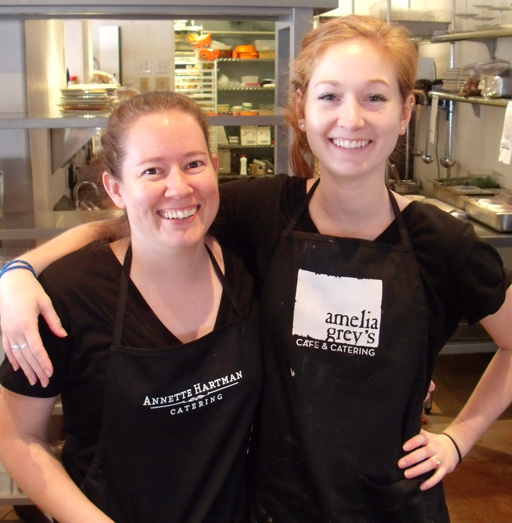 Go visit them at AmeliaGreysCafe.com. 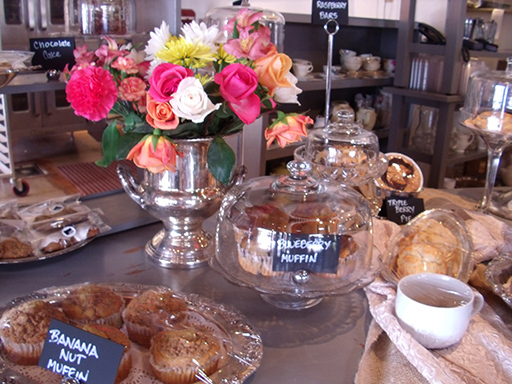 Better yet, head over there for a High Tea or for lunch. 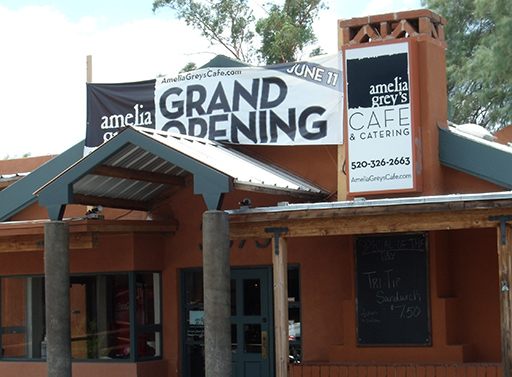 Welcome to Tucson, Amelia Grey’s Cafe & Catering — local businesses are good businesses! The Carondelet foundation needed six banner stands that would be easy to read behind the registration tables. We could make nice banners, but one must always consider the restrictions: tables covering the bottom half of the banners, people sitting in front of the banners – sometimes standing] and a lot of people milling around. This makes for a very visually-busy area. Practical solution: bright colors at the top that are easy to read and then imagery that will stand out in a crowd [literally] while still remaining very attractive. 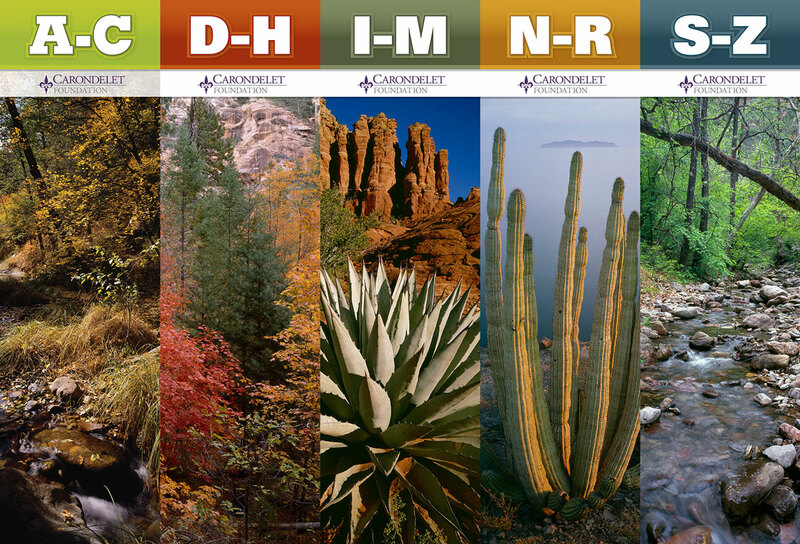 Using a handful of photos provided by one of the doctors, these six banners will look great for registration as well as calling people to the correct tables. They were also all produced by us, which is always great for our clients. We like to keep the production of all our work under one roof. And then all 5 of the registration table images side to side. Though we produced all of them in-house, we didn’t assemble all of them for a photo op [sorry]. 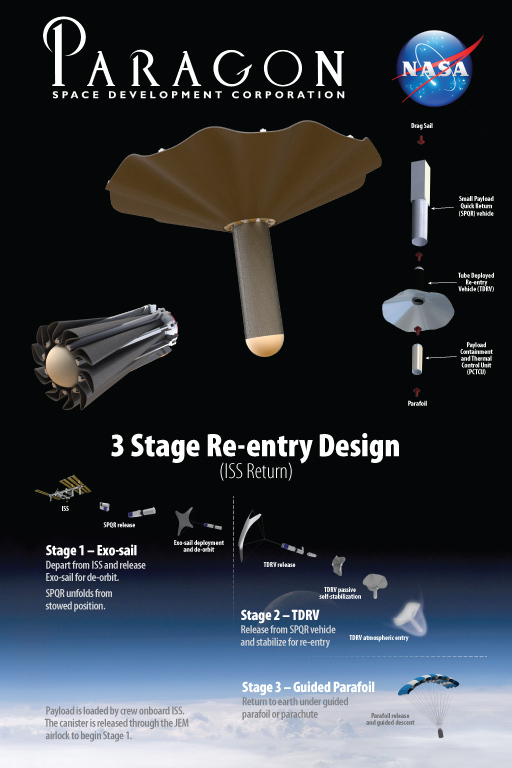 Click on the image to see it larger. 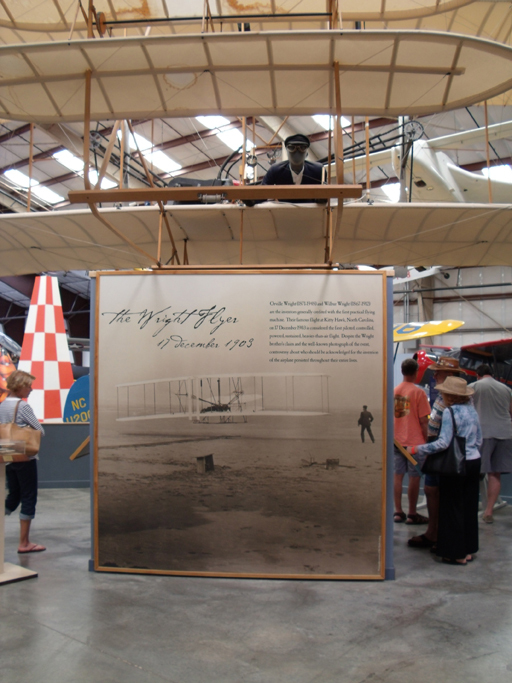 Pima Air and Space Museum had a full size replica of the Wright Flyer with a stack of old photos and were needing the museum graphics designed for their exhibit. 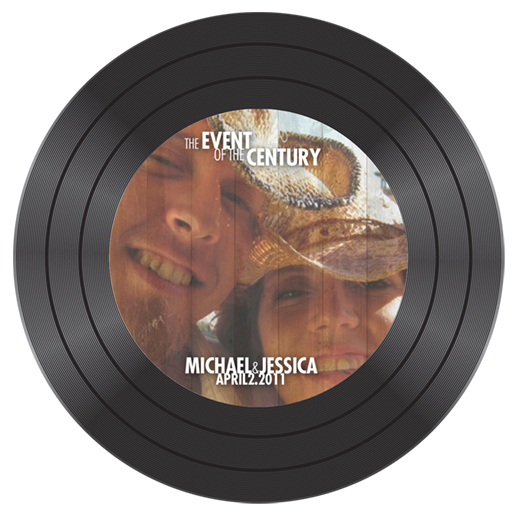 This project was thoroughly enjoyable from beginning to end. A museum exhibit? In my family, every vacation had us stopping at state and national parks along the way, with extra stops at pretty much any museum we could find. Did you know there is a firehouse museum in downtown San Diego? Sure, everyone else goes to San Diego for the beaches… okay, back to the story. 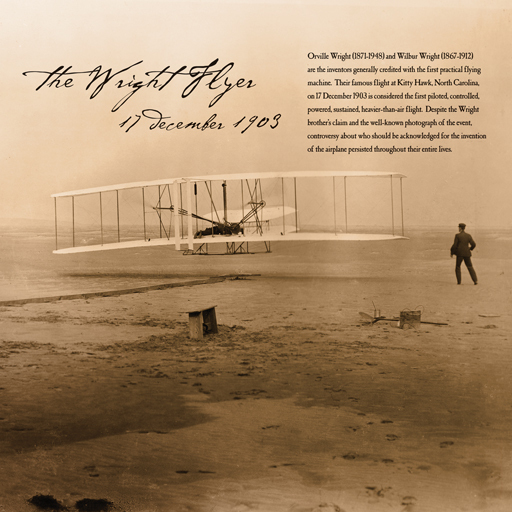 The great guys over at PASM had already designed the stand to hold the aircraft, and I needed to create the graphics to showcase the aircraft. 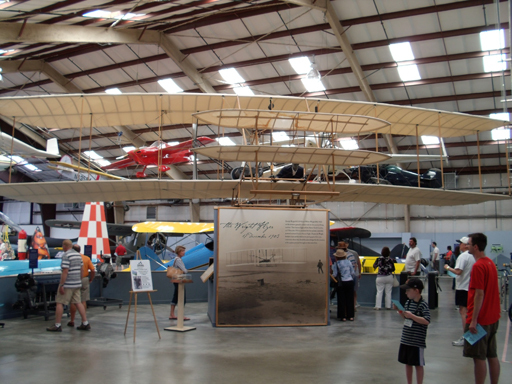 It stands just inside the main doors to the exhibits, the first plane you will see when you walk in. What better imagery to use than the plane just lifting into the air in the middle of the dunes, two brothers out to prove that man could fly. Colorize it a bit to warm it up and it became a wonderful centerpiece to the exhibit. 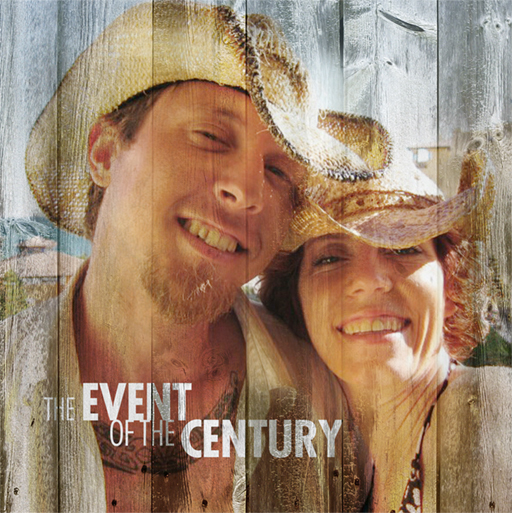 Their story and photos complete the rest of the exhibit, all with a scratchy background of antique paper and imagery. 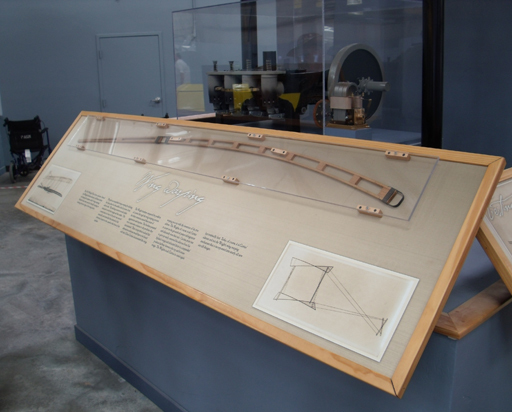 Below is the rear of the exhibit with a copy of the motor used as well as a cross section of the wing to help explain how the brothers turned their plane by warping the wings. 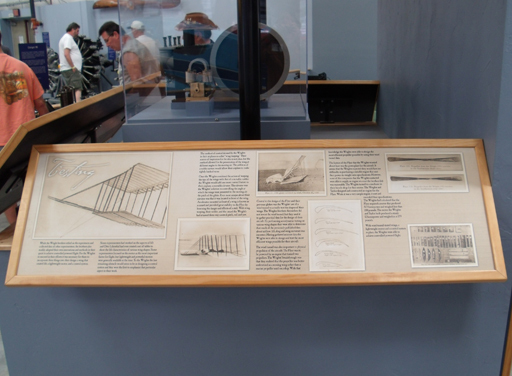 Part of the exhibit on the left hand side, presumably for reconditioning. Holiday Inn across the street needed some posters designed pronto, to which we happily obliged. They were just coming off of the huge Gem Show and needed some non-Gem Show centric signage. I found several attractive drink photos after digging through our stock photography site for a while, and through the process of design elimination – and Holiday Inn’s green logo – it was a relatively easy choice. 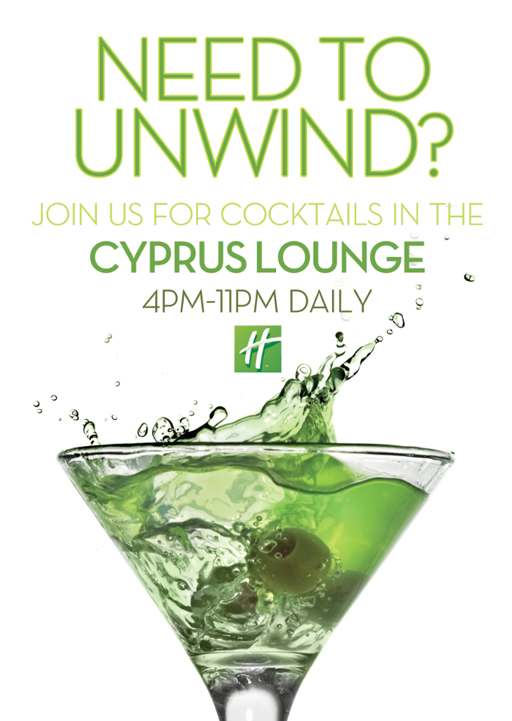 Add some attractive typography and coloring and now the eyes go to the drink, the logo, and Cyprus Lounge. FYI, there are still way too many hours to 4pm as of the writing of this post. I shall remain “wound” for the remainder of the work day. This scenario is played out daily: client has a product but is unsure what the design to promote it should look like [don’t be surprised – that is my what I do]. For the design here, the client has a locking plier with an additional thumb wheel, which is a great idea. I spend most of my time pulling the pliers back out, adjusting, and then trying again. It’ll be sold in a booth at a few car shows this autumn, so not only does in need to appeal to all the car aficionados, but to the wives as well with the push as a gift for Christmas. It doesn’t cost that much, so that is a great idea. Oh yes, and don’t break the bank on the design and production of the banner. The solution, as you can see, was to take a high-res photo of the pliers, mask out the background and put it on a metal surface. Large red text pretty much seals the deal, but the ribbon in the corner is there to hopefully catch the eye of the Christmas shoppers. Is it a success? We’ll all have to wait until after the car shows have concluded. A Christmas tree in the booth might be a good attention getter as well. Check them out at www.ddlockingplier.com. Ah, Frost. 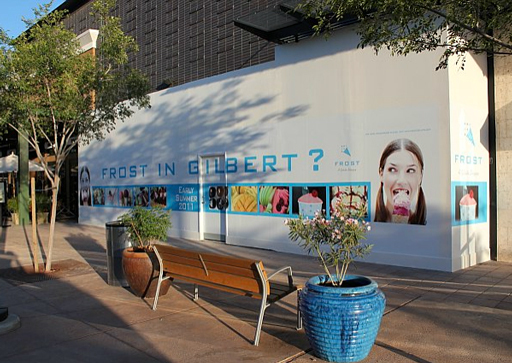 It used to be that you had to live in Tucson to enjoy the wonderful Italian gelato from Frost, but not any more. 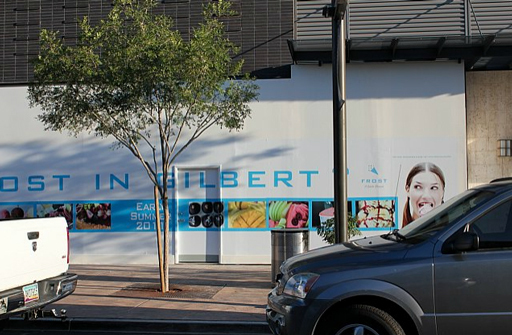 We printed out their large banner to put on the construction wall encircling their soon-to-be-opened shop in Glendale. 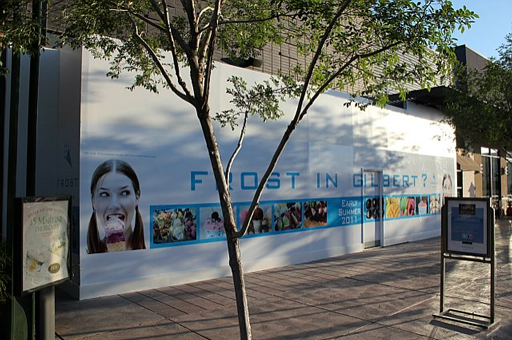 Read more about Frost and their story, and then go try them out this summer. Great store, great product. We had to slightly modify their artwork to make it wrap-friendly on either end, and then we also made sure there were easy breaks between section with the words. It would be hard to go wrong with such great images. Is it wrong to wish for the power to go out at work so that a trip to Frost could be made? I think not. 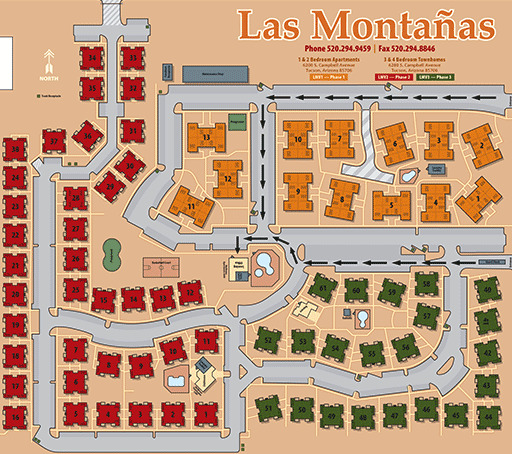 While looking for another file I came across an apartment map from several years back. It was made to be both handed out and as a large poster for the office. Not only is it functional but it is also attractive. We’ve all received maps for hotels or other places and have gotten totally lost. This map does its job well. Now I want to go did up all the other property maps we have done just to compare [and share]. Many times the role of a graphic designer is to take a handful of images and put them together to make a good looking piece. Is somewhat MacGyver-ish in the way he would take a plastic fork, some string and a cardboard box and create an armored tank. Thankfully we had better images to work with than a cardboard box, and who can go wrong with NASA related items?